Mehmet Cerrahoglu, Görkem Kasal, Ergun Kuyucu, Muharrem Bayrak, Fatih Dokgoz, Berat Efe Parlar, more demonic debauchery than Rob Zombie’s 13th birthday party, and about 15 minutes weeping in the shower after watching. Arda (Parlar) is a young Turkish boy who is awakened in the middle of the night by strange moaning and other sounds coming from a TV that doesn’t appear to be on. A ghostly hand emerges from the darkness and follows him as he runs and screams for his mother to wake up. But no one comes as the hand slowly moves towards him. Flash forward years later and Arda (Kasal) is a rookie police officer assigned to a special unit of cops who patrol rural Turkey in a van. They hang out at a restaurant and place bets on soccer games, boast about their sexual escapades, and bully the staff. The team consists of morally shady but spiritually conflicted members Baba (Cerrahoglu), the squad leader and father figure to Arda, Remzi (Kuyucu), the hard-bitten veteran, and Yavuz (Bayrak), the crude ill-tempered loose cannon. A Turkish Police Squad. (The Turkish Leslie Nielsen not pictured). They get a call for back-up and while searching for their fellow cops in distress they accidentally hit someone and crash into a ditch. When they emerge from the van, they are unable to find the victim but eventually locate the source of the call for back-up: a rotting mansion where they uncover an unholy host of horrors. We then flashback to earlier in the day. Arda relates his childhood memory of the moans, the phantom hand, and the terror he felt. Baba, who has looked after Arda since his parents’ death shortly after his encounter with the hand, believes his story and admits to seeing a shadowy figure following them, unsure whether they are alive or dead. Arda experiences a series of hallucinations that indicate that something indeed might be after all of them. That ain't the Jolly Green Giant, I'm afraid. Back in the mansion, the men discover victims bound in leather and wire, kept in cages, and suffering from wounds inflicted by torture, bleeding, and maybe something worse. A hooded figure stalks them, takes them down one by one, and are bound and offered to the leader of this bizarre and blood-soaked ritual. You probably won't find this tidbit in Chicken Soup for the Soul. The team is dispatched one by one by the leader in various gruesome and horrific methods that are best left to be seen should you and your ironclad stomach choose to sit through this. The leader's purpose is to reveal to each of his victims a rebirth after death. None of the team survive, save for Arda whose fate (as we learn in the end which will not be spoiled here) has been decided since his childhood encounter with the spooky appendage. OK guys, this one was rough. There were no ancient Hollywood relics to mock, hairdos to laugh at, or bad lighting, jump cuts, or regressive stereotypes to guffaw. 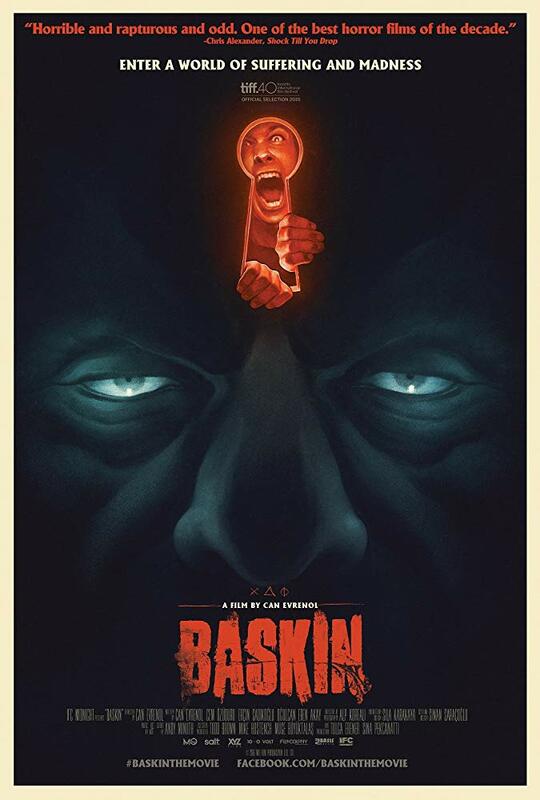 Baskin assuredly delves deep into psychological and philosophical terror without being exploitative and masterfully manages to keep viewers glued to the screen as well as looking away. The film is a surreal dark ride filled with inescapable dread, primal fatalism, and nightmarish depravity. The title translates to “raid”, as in what the cops do when they break into the torture temple, and was probably left untranslated in the U.S. release as to not be confused with Gareth Evans’ superb actioner The Raid. But the only thing these two movies have in common is an uncompromising commitment to gory spectacle. With its dread-filled atmosphere, hint at cosmic horror, and astonishing ending, director Can Evrenol subtly nods at Carnival of Souls as well as the works of Lucio Fulci and Dario Argento. But it's definitely its own thing, and an auspicious debut for Evrenol. The movie will stay with you and may take a while to settle in given the cultural context and gruesome theories of human nature it offers. In the end, Baskin is not really my cup of tea or ice cream flavor of 31. I prefer my horror fun, scary, and provocative, but this one was a grueling watch. With its scenes of extreme suffering, sexualized abuse, and heady violence, it's not recommended for a lighthearted candy-corn chomping Halloween night marathon. But if your Halloween nights are anything but lighthearted, add Baskin to your list.